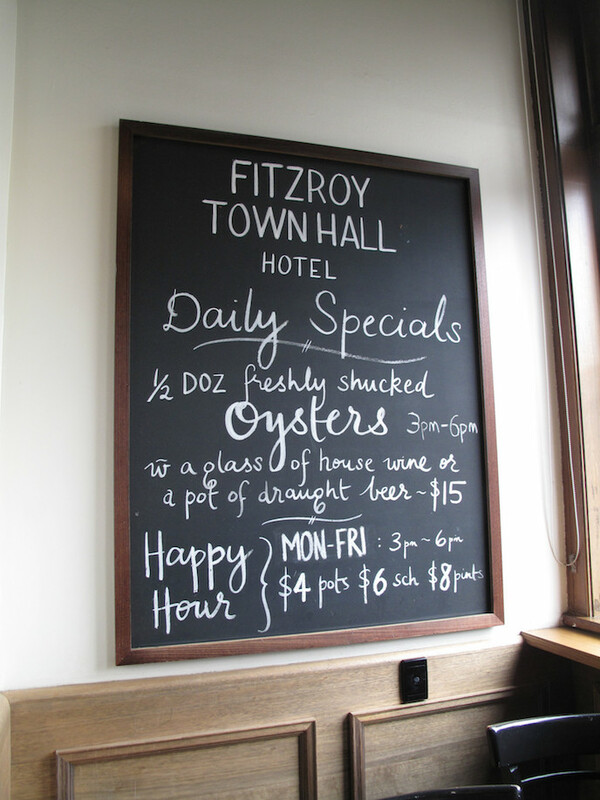 It’s been a while between drinks in the Sunday roast lunch department for CTS, so I am delighted to step out – and outside the Melbourne’s west – to meet Nat at the Fitzroy Town Hall Hotel. It’s a lovely place on Johnston Street. It’s done up nicely, though I suspect it’s life and times stretch way back. Oddly, I have no recall of it from my early-days-in-Melbourne – my first three abodes here were in Fitzroy. But then, food was pretty much – but not entirely – mere fuel for me then; I was busy with other things. 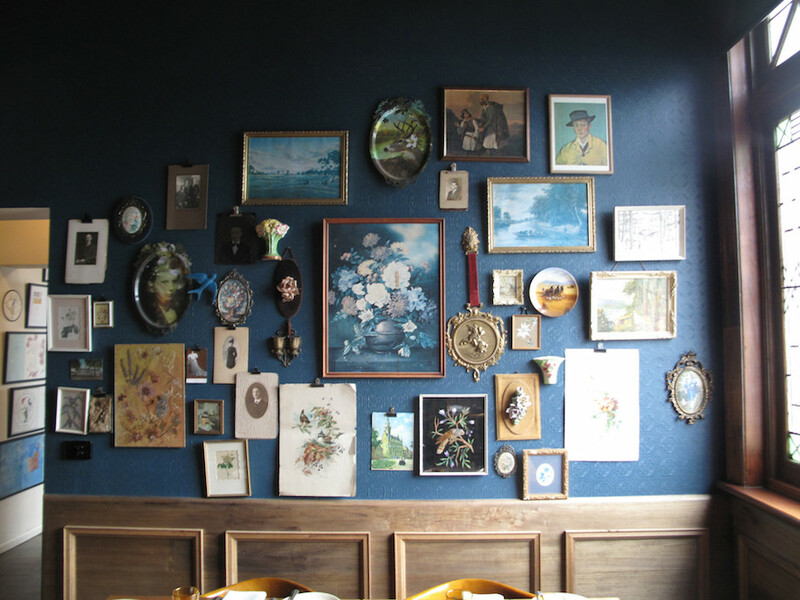 Going by the menu and the various blackboards around, this pub is a serious foodie destination. But we’re definitely here for the roast. Nat has a strong hunch I’ll be delighted. Most of the Sunday roasts written about in the CTS archives are of the cheap ‘n’ cheerful variety that lob in somewhere in the $10 to $15 range. But we are only too happy to pay more for real class. Our plates of Diamantina topside wagyu with winter vegetables, Yorkshire pudding and gravy are a dream and worth every cent of the $25 we pay. All is good; all is – actually – perfect. Even the water cress fits right, rather than being a mere garnish. The celeriac remoulade on the left is pungent enough for me to ignore the proffered selection of mustards. 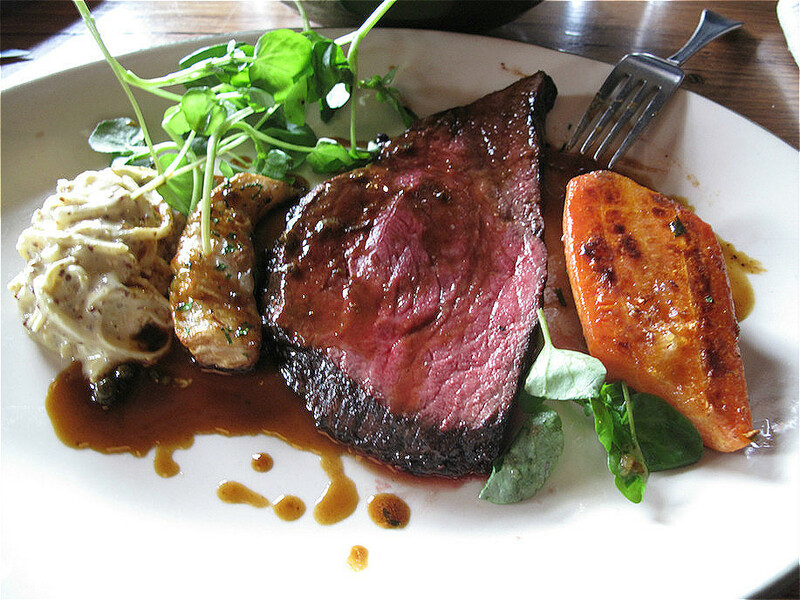 The beef is rare, juicy, stupendously good. At first glance, I start wondering how much an extra slab of meat would cost. … the bowl of sooper dooper spuds we share is so generous. 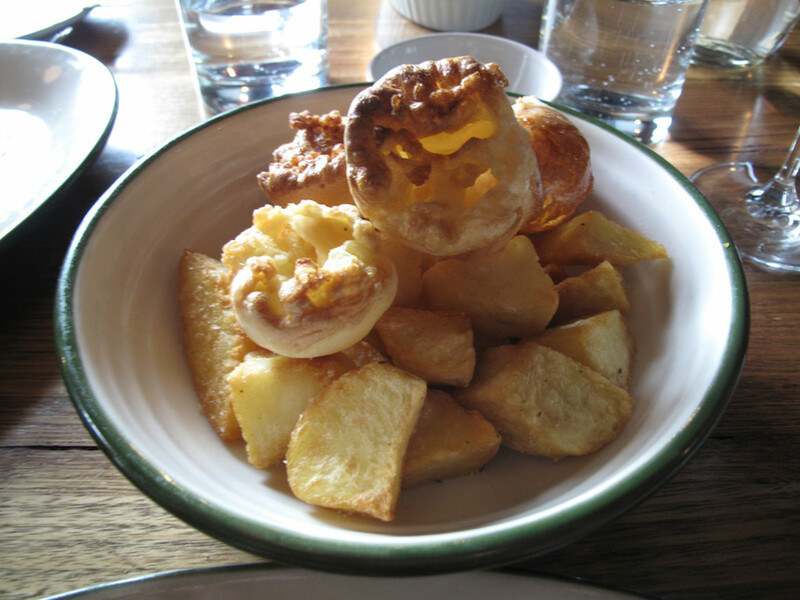 With them come a handful of Yorkshire puds. And even these are winners. So often, in my experience, they are akin to fossilised turds. Here, though, they are light and a boss part of our meals rather than a nod to stodgy tradition. 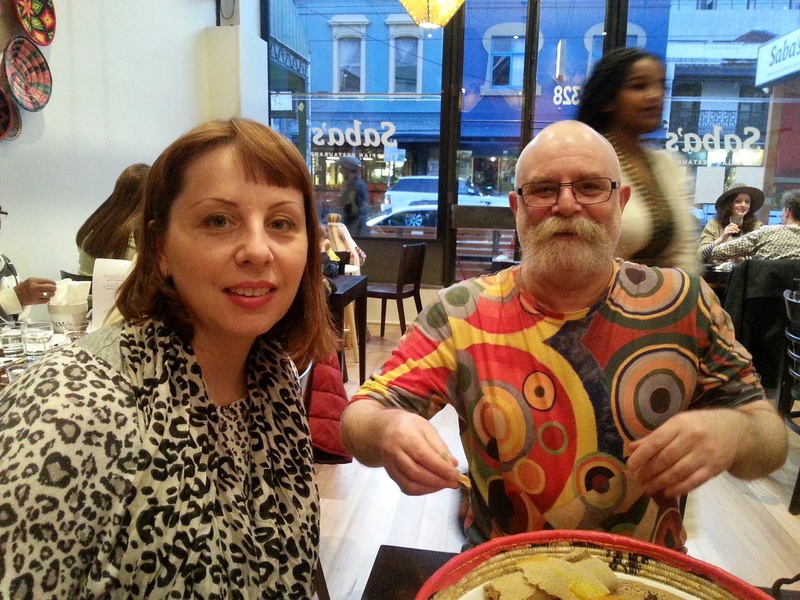 Of the foodie friends we break bread with, Marketa and Nick are two lovely folks whom we see too little of. 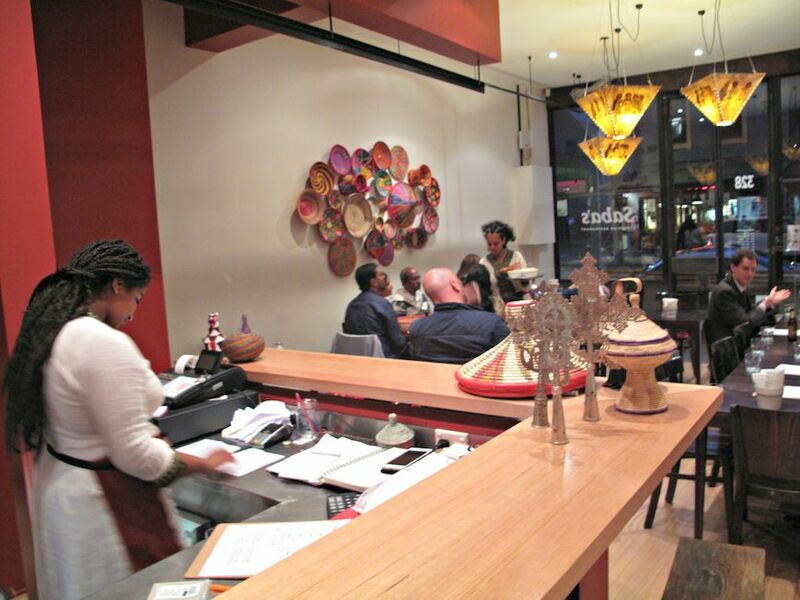 So I am only to happy to agree to a proposal to join them at a new Ethiopian eatery … in Fiztroy. Turns out that Marketa and the Saba after whom the restaurant is named know each other from another place – a gym! For Marketa, this will a first try of Ethiopian tucker; not so for Nick, though his single encounter is just a fading memory. 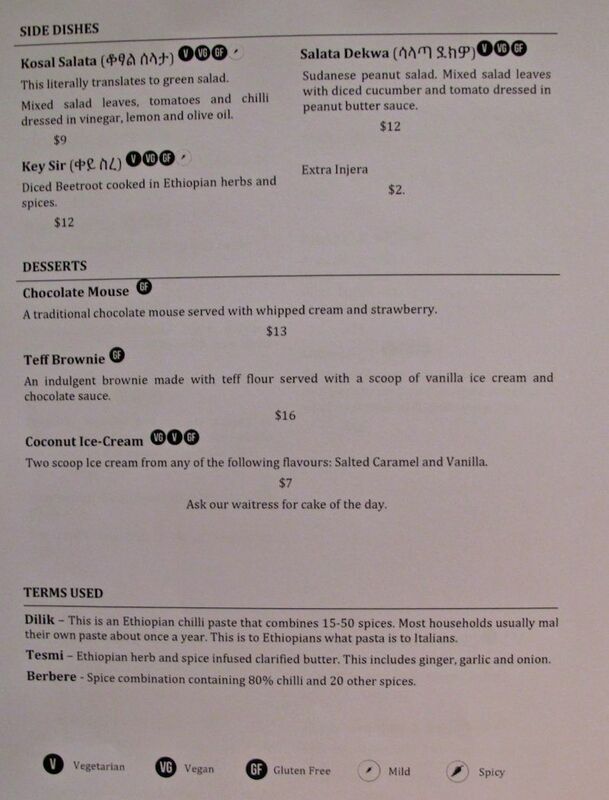 But even for me, veteran of so much western suburbs Ethiopian food, there will be something new. 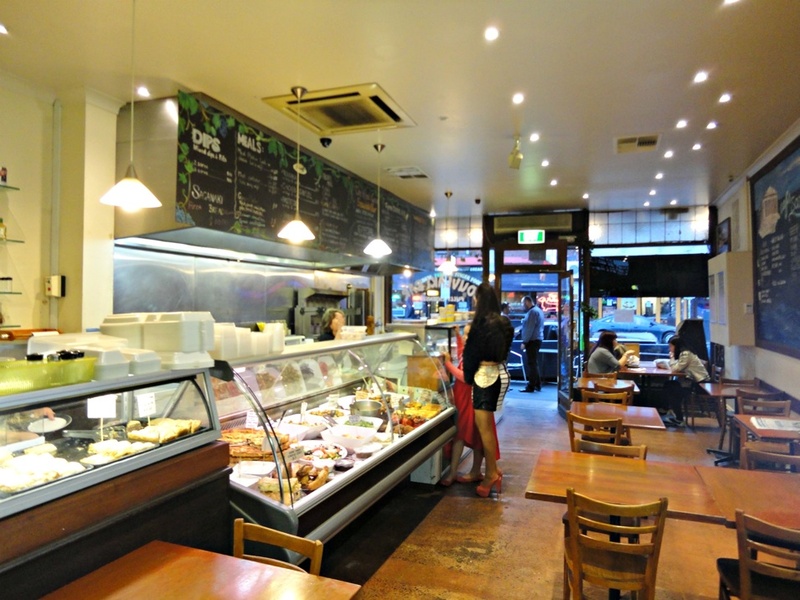 As recounted in this story about Lemat Injera Bakery, for most of the Ethiopian community’s time in Australia, the grain from which injera is made – teff – was not allowed to be imported. 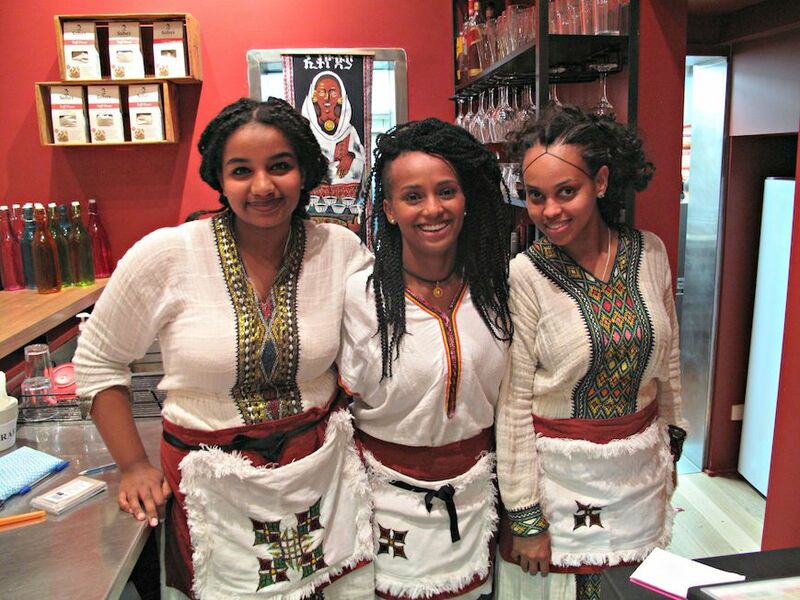 So the injera makers – as cultures have done through the ages – experimented and adapted, using a mix of grains, until they created something like, well, injera. Those import restrictions have been lifted now but as far as I know this will be my first ever encounter with teff injera. 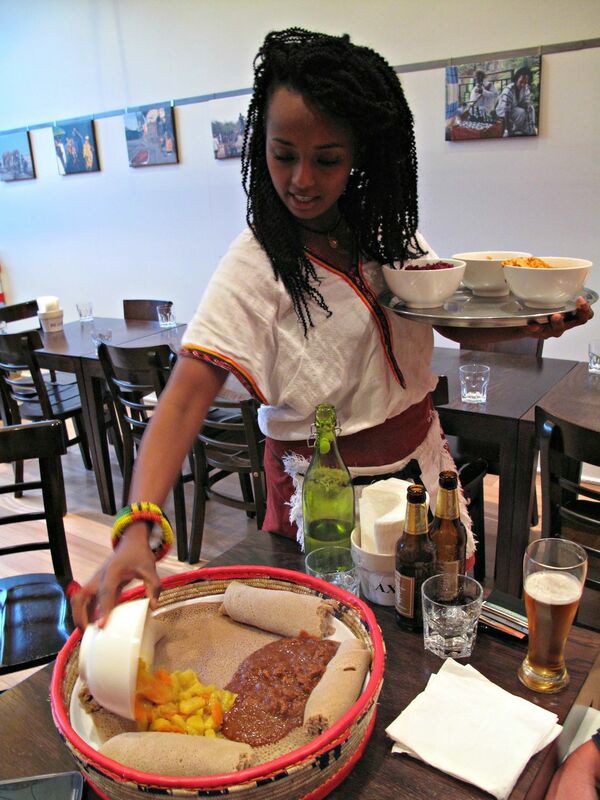 I arrive early so have time to talk with Saba and her staff about injera and Ethopian food in Melbourne. 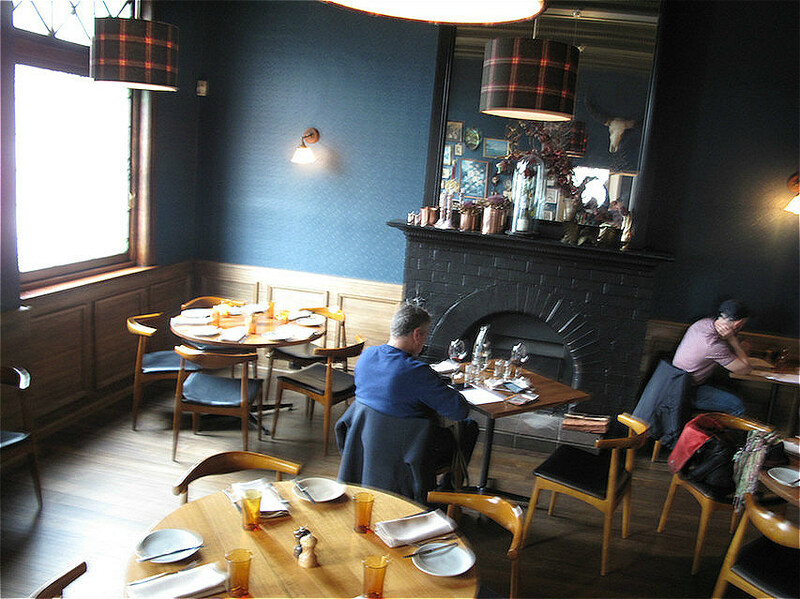 The eatery – smack dab in the middle of Brunswick Street’s hipster heaven – is bright and light and the staff do a fine job. As we’re enjoying our meal, people are being turned away. 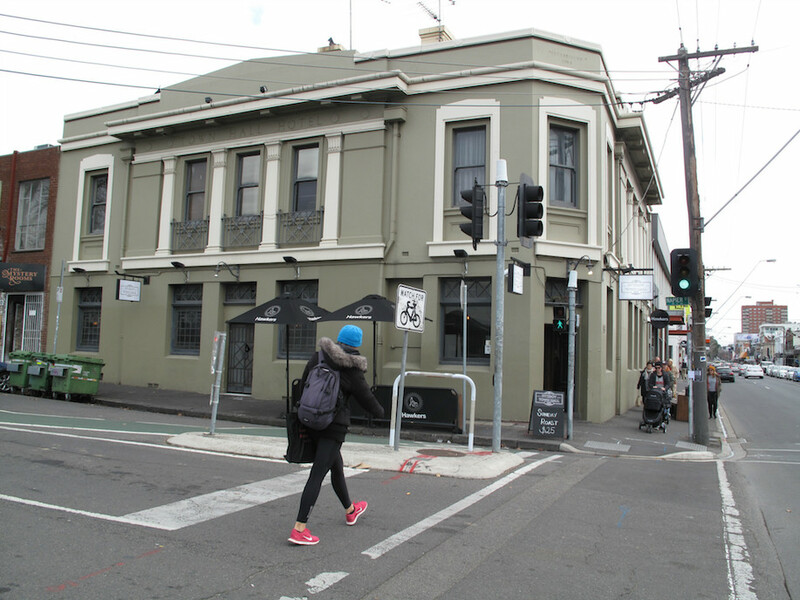 Seems like Saba’s is going to fit right in in Fitzroy! But Fitzroy isn’t Footscray so I have been bracing myself for prices way above what I’d pay for similar food much closer to home. So, upon perusal of the menu (see below), I am pleasantly surprised. 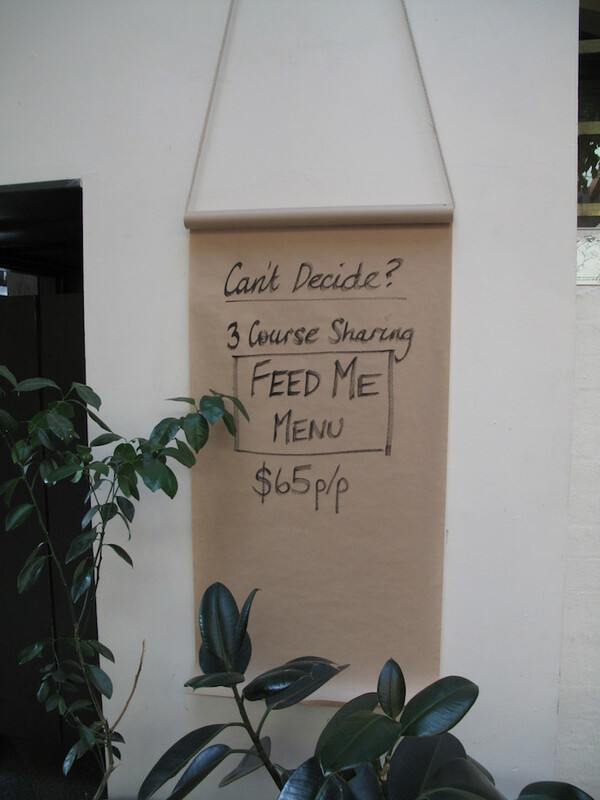 Yes, the prices are above what we all pay on Nicholson Street or thereabouts – but not ridiculously so. I’m happy to be in the house and catching up with my friends. 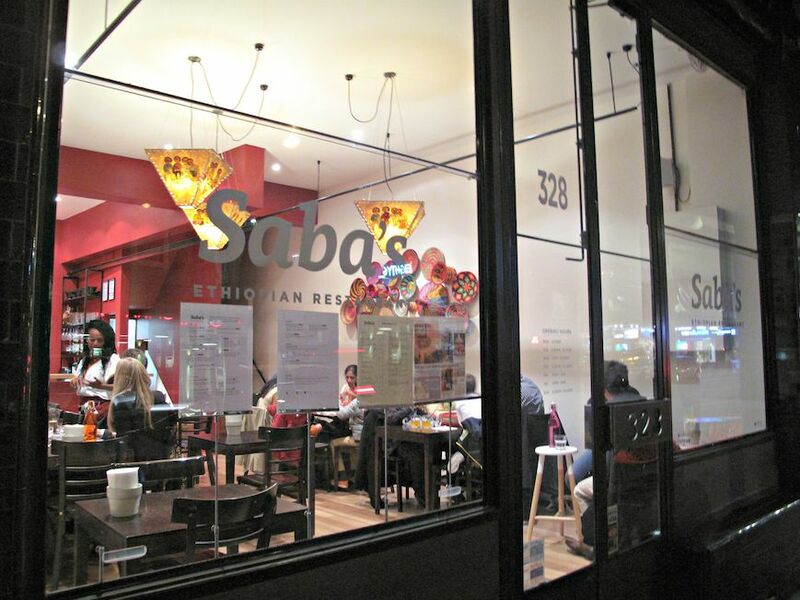 Other differences between Saba’s and the western suburbs Ethiopian eateries are the names of the dishes. 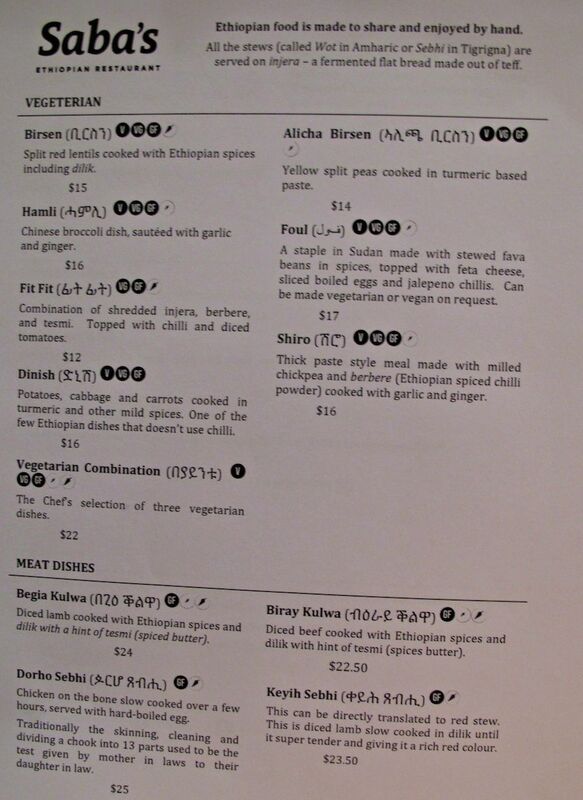 I don’t get around to asking Saba why this is so – but can tell, reading between the lines of the dish descriptions, that I am going to be eating in familiar territory. 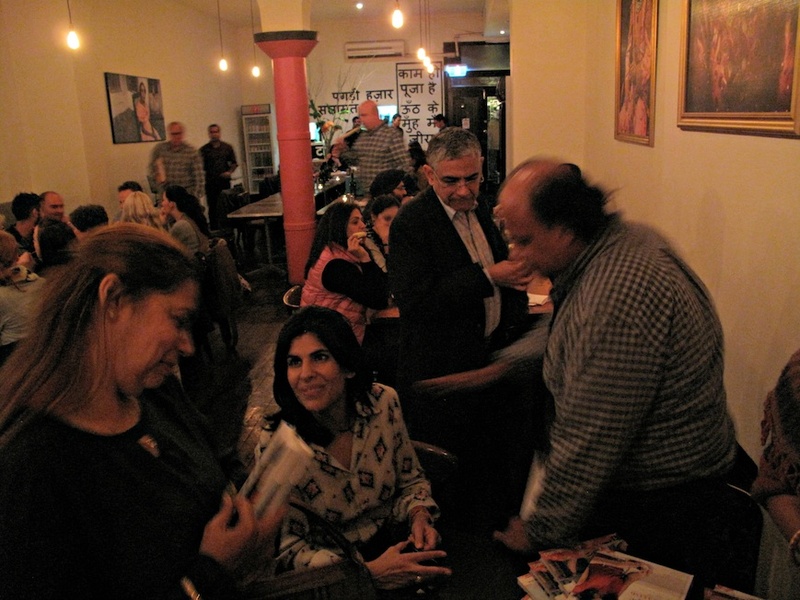 Saba places a restraining hand on our eagerness in terms of ordering too much. 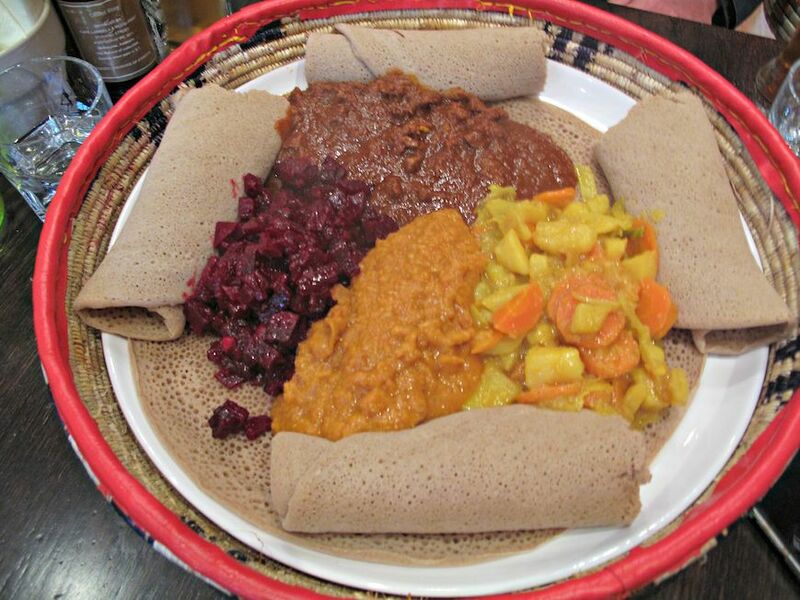 So what we end up with is a splendid Ethiopian meal of one meat dish, one pulse offering and two vegetable dishes. 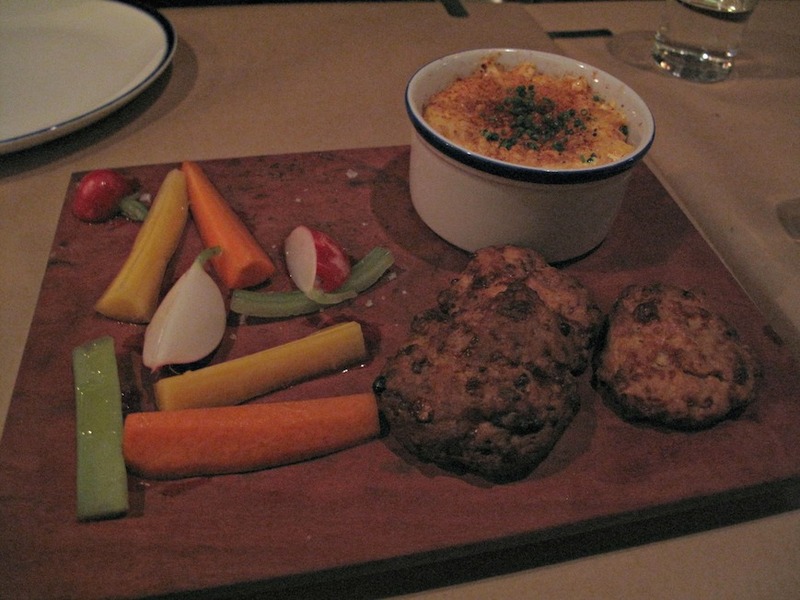 It’s all very good, including the carrots-cabbage-spuds of dinish ($16) and the “side dish” beetroot, here called key sir ($12). Our meat selection, keyih sebhi ($23.50) is a wonderfully rich, deep red stew of lamb with just the right chilli kick. It’s almost like an Ethiopian bolognese! As for injera made from teff, I can honestly say that I didn’t notice much difference – maybe this injera was a bit plumper. Approaching the Rochester Hotel, my mind is full of dark thoughts. 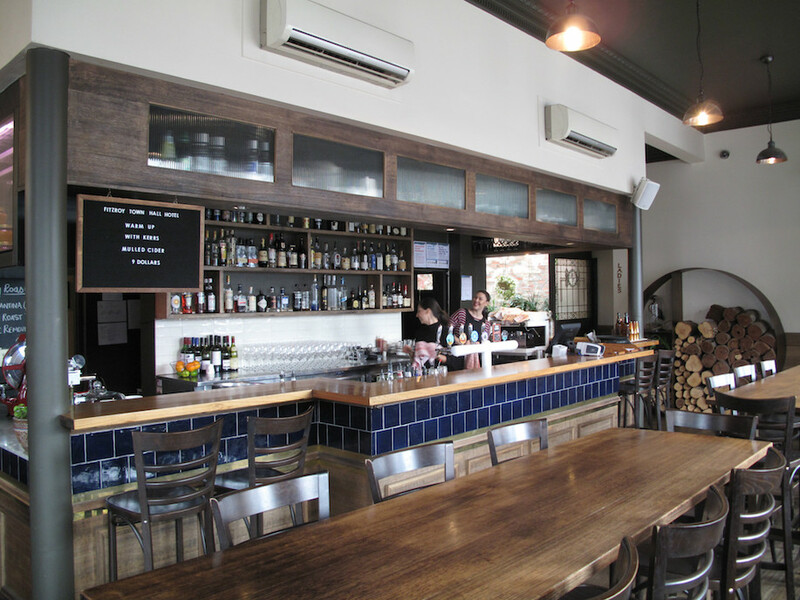 When Consider The Sauce hit Miss Katie’s Crab Shack in its previous carnation in North Melbourne, the pervasive gloom wasn’t just a hindrance to photography – it also lessened the enjoyment of our food. It was bit a like a food version of Dating In The Dark. 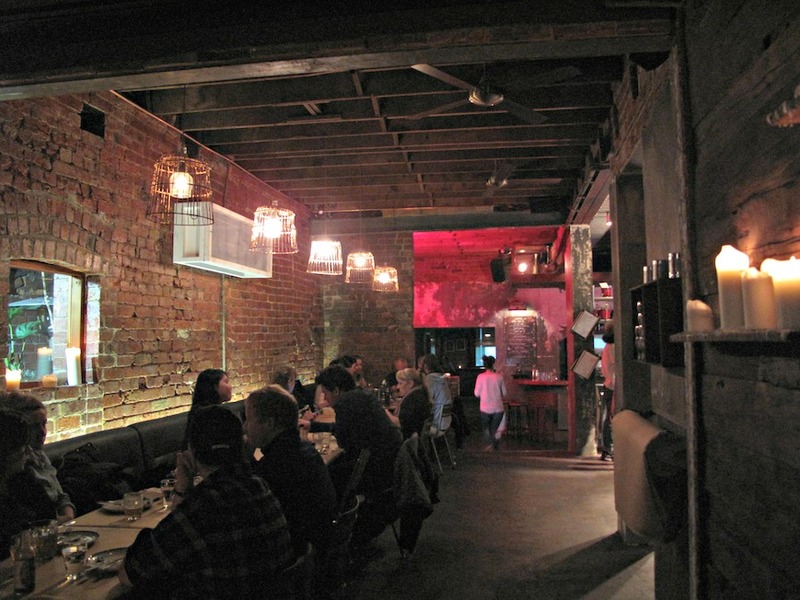 My heart sinks when I enter the bar area of the Rochester – it, too, is gloomy. Exploring a bit further, my mood lightens when I discover the dining room “out the back” is considerably brighter. 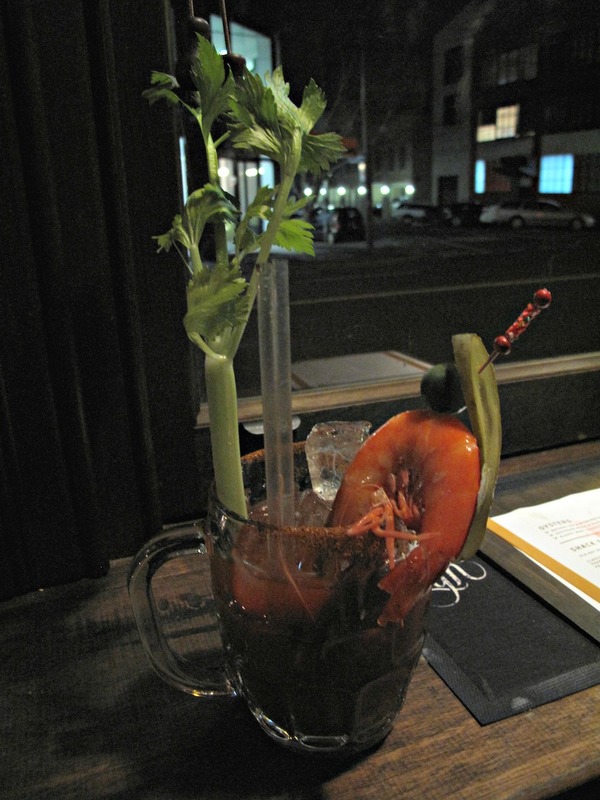 My spirits veritably soar when I receive my bloody mary ($18) as I await my friends. It’s sensational, delicious and worth every cent of the admission price. Off we happily troop to the dining room to sort out or collective order. 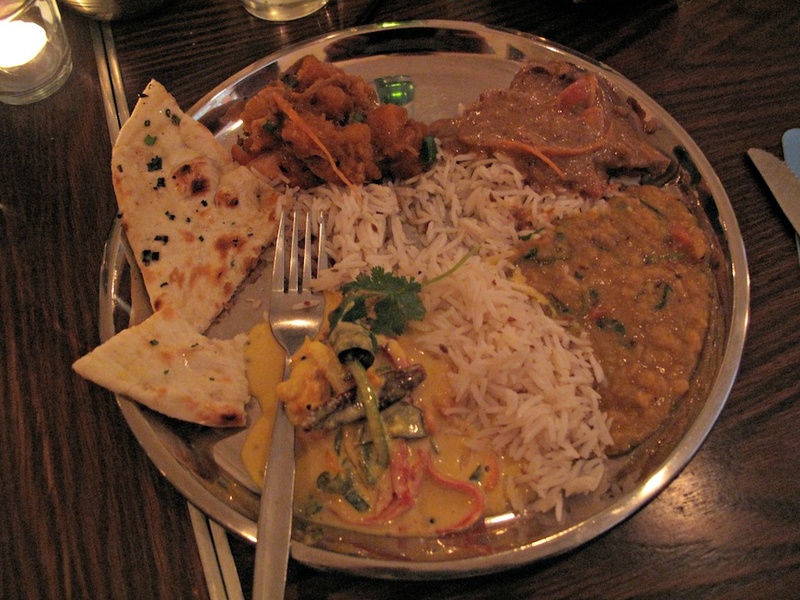 We go two starters, two star-attraction mains and one light, vegetarian option. 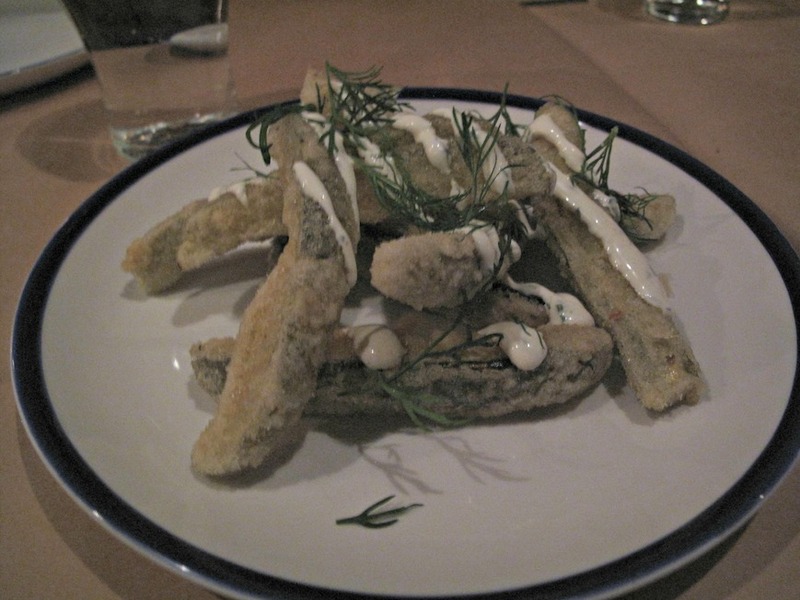 Deep-dried pickles are, initially, a surprise as I have been expecting the heavily battered discs I’ve had in New Orleans. But these lightly-battered spears are very good. It seems as if the cooking process has lessened the vinegar factor, as they’re mild of sourness. Crab dip is, well, very crabby. And also very rich and yummy. The accompanying bits and pieces -including biscuits that are more like cookies – fall a little short, however, of being substantial enough to handle all the pot of dip. I go the seafood boil. 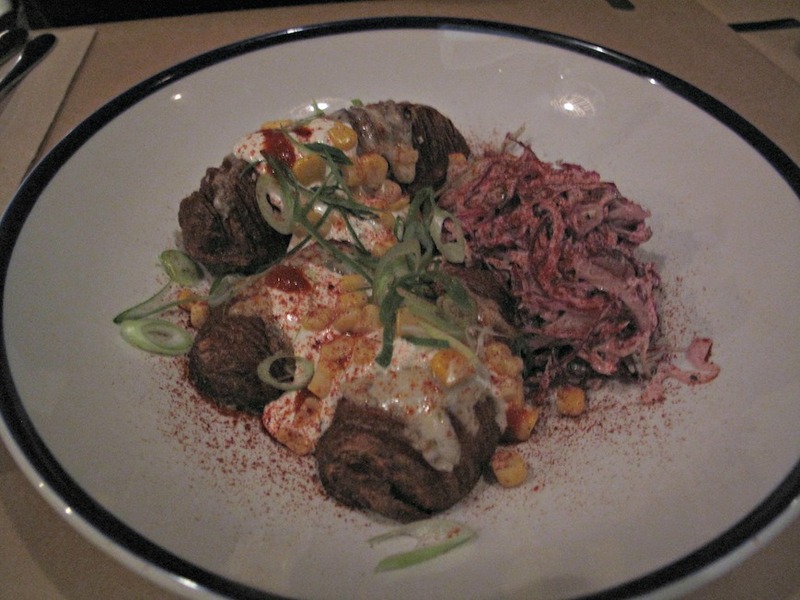 The basic price of $25 includes a blue swimmer crab, kransky pieces, chat spuds and corn. 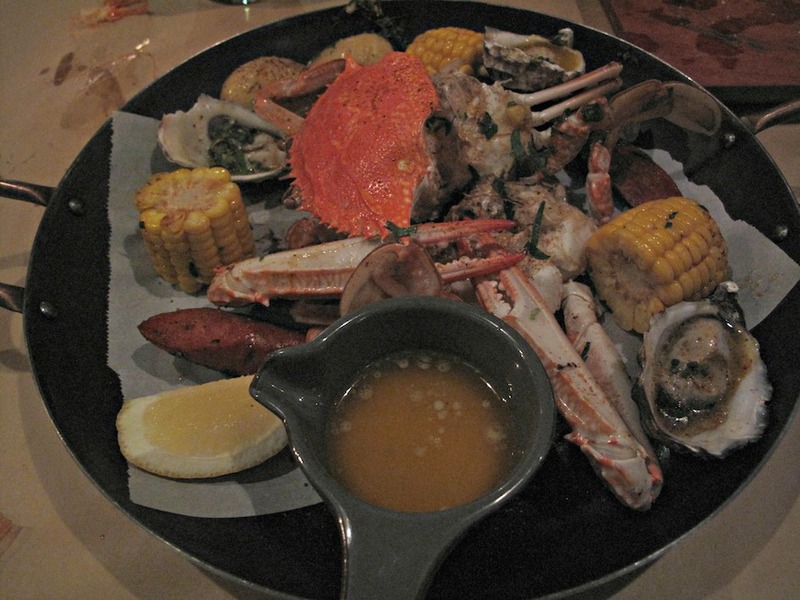 From there, more crab – or oysters, clams, mussels or prawns – can be added for extra $. I go with oysters for $10. I get only three, bathing in seasoned butter, but they’re fabulous. The hot-dog-style kransky pieces are a highlight. I have a splendid time extracting sweet, delicate crab meat. 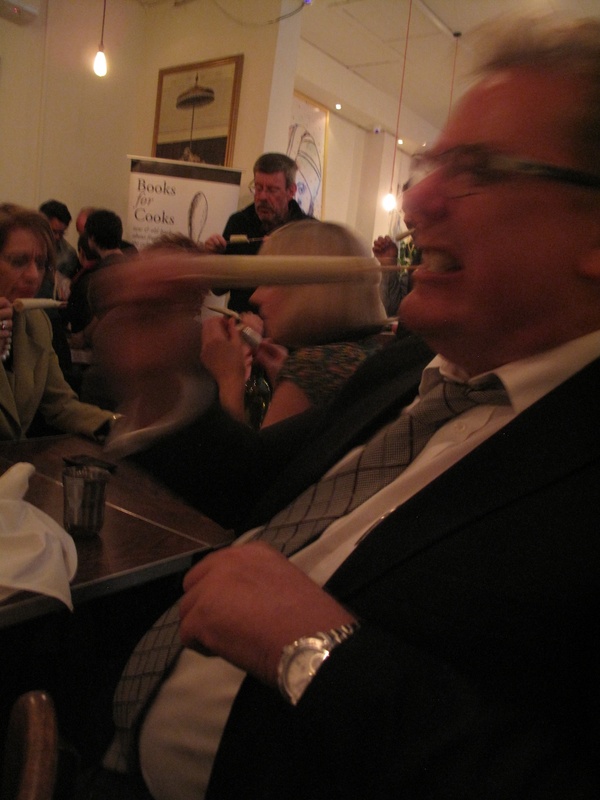 But here’s the rub – despite the high quality of its individual components, my dish is lacking a knockout punch. I suspect that could only be had, under current arrangements, by adding a lot of extra seafood that would make it prohibitively pricey. 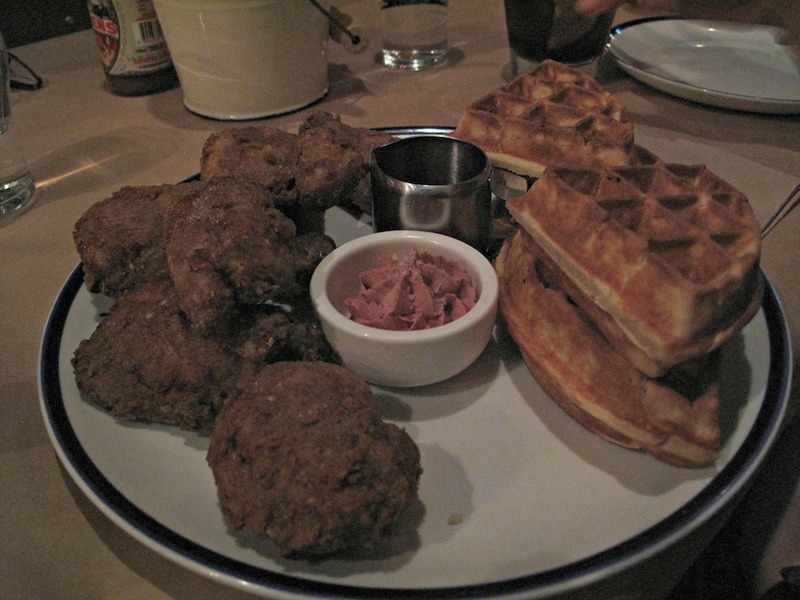 … we reckon Miss Katie’s fried chicken ($24), which comes with either mash or waffles, is this establishment’s outstanding dish – and excellent value. Yes, in a crab shack. It’s a good thing, then, that one of my companions orders it. It’s an even better thing that it is so very, very good and such a substantial portion that we all have a good taste. The coating is light but wonderfully seasoned and the meat itself is perfect. Could this be Melbourne’s fried chook champ? Or, more accurately, Melbourne’s non-Korean chook champ? My other pal’s hasselback potatoes with jack cheese and slaw ($15) do the trick for him, though I suspect he’s very appreciative of the couple of chicken pieces that come his way. 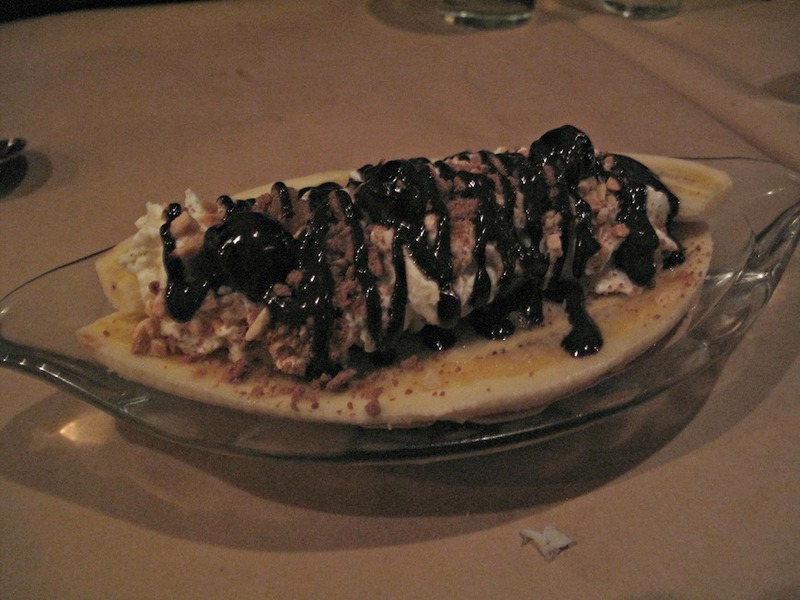 Our finale – banana split ($12) – is enjoyable though a bit rich price-wise for an American-style fantasia that is little more than fluff. Cooks For Books has been hosting dinners for a long time, so I’m not quite sure why this particular gathering sparked my interest. 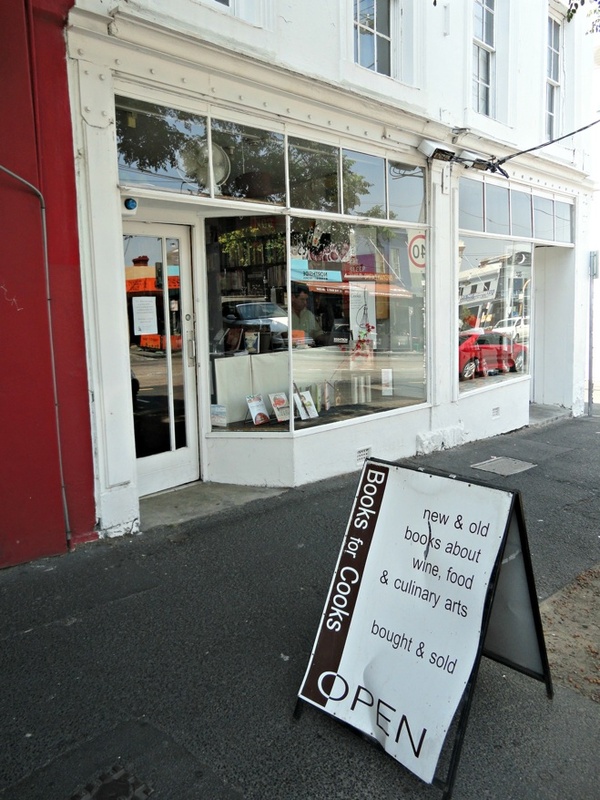 Perhaps it was down my recent visit to that fine Fitzroy purveyor of fine and foodie reading. And no doubt it was also about seeing what these affairs are about, seeing as they have a resemblance to the ongoing CTS Feasts. Anyway, in a fit of spontaneous extravagance, I sign up and here I am at a famed North Fitzroy Indian eatery. Mind you, the price is way steeper than a CTS Feast – all up, just shy of $100, though that does include a copy of Anjum Anand’s latest book, Quick & Easy Indian. Seems fair enough – and I am happily anticipating some fine food being eaten and good luck in the lottery of dining companions. I estimate the dinner is attended by more than 80 guests, including a top table with the author and a bunch of representatives of the retail book business. I strike it very lucky in regards to company. On my right are Paul, his niece Laura (both pictured above) and wife Gail. They’re from the Moonee Ponds/Essendon area and Paul turns out to be as mad a foodie as I’ve ever come across. 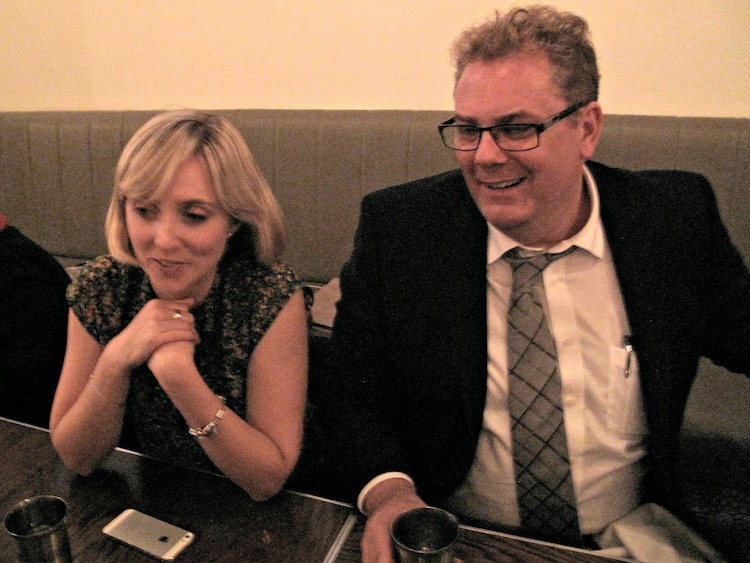 We have a fine old time swapping opinions and tips as the night unfolds. The noise levels are high and the situation challenging in terms of photography. So much so that in a technical glitch (i.e. operator incompetence), I fail to successfully snap the lovely company on my right – Gail, Angela and their party. Sorry ’bout that! Likewise, I cannot provide photographic documentation of the lovely entrees (see menu below). 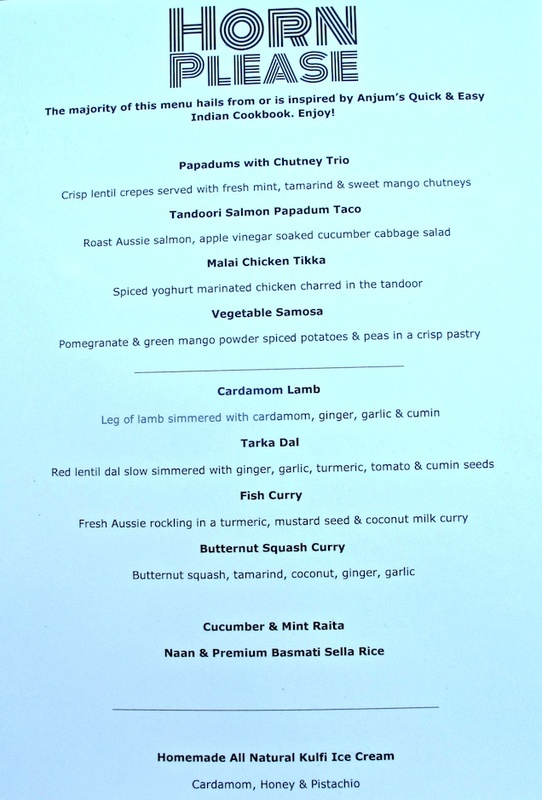 By common accord, though, the “tandoori salmon papadum taco”, with its tangy dressing and beaut fish, is a big hit. 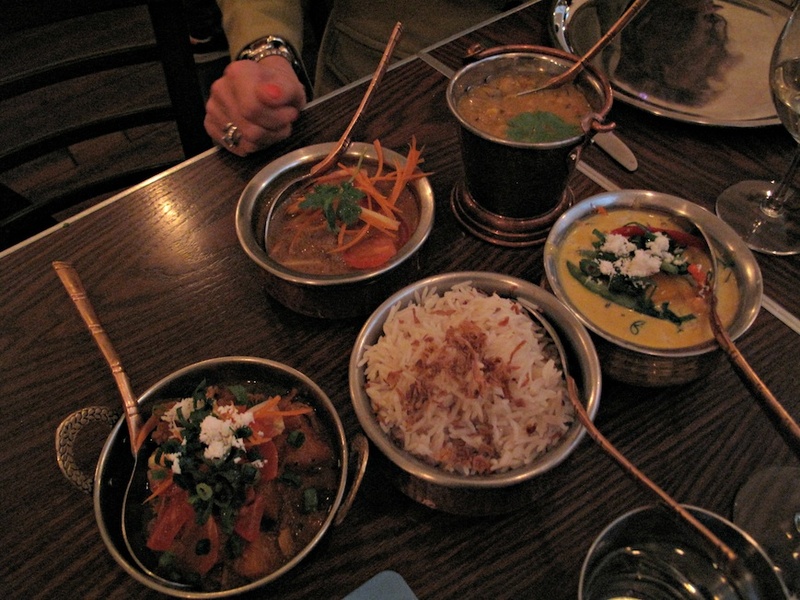 No so much problem with the mains – and very good they are, too, though the butternut squash curry screams “pumpkin” to me, so I mostly go without. Best of all is a mildly spiced but incredibly rich and flavoursome fish curry (on the right, above). Before dessert, Tim hosts question session for Anjum, asking several himself and taking several from the guests, including one from yours truly about salt and its relationship to Indian cooking. Dessert – cardamom, honey and pistachio kulfi on wooden skewers – is mindblowingly fantastic. So rich and creamy, so alive with powerful, almost overwhelming cardamom flavour! None of Anjum’s previous books are among my modest collection of Indian cookbooks and she is a new author to me. 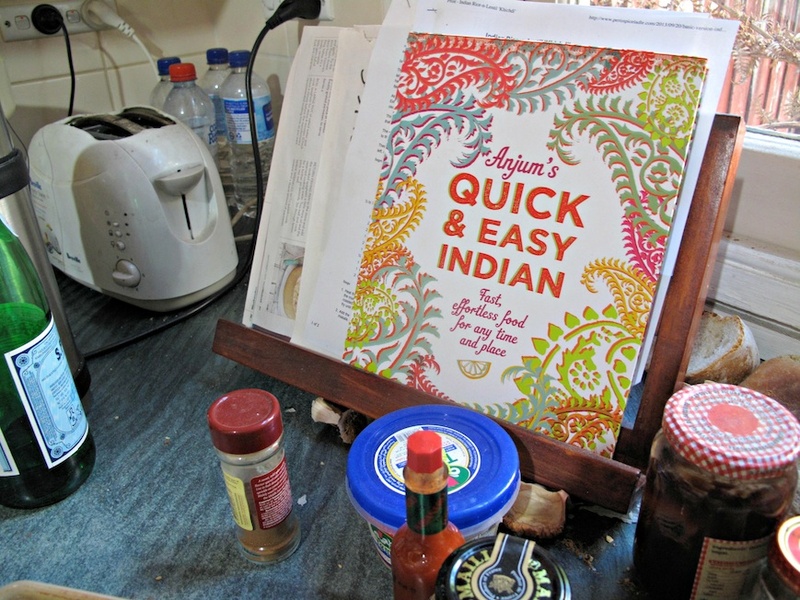 Quick & Easy Indian is beautiful to read and look at, though it’s far from traditional. Its recipe line-up, for instance, includes the likes of quick masala dosas using rice paper, ricotta-stuffed aubergines in tomato sauce and a Goan fantasia in the form of chorizo with white beans and greens. As someone who has come to love the online ease with which I can get my hands on music and books, and the information about them on which to base my buying, I have lamented the lack of bricks and mortar businesses in Melbourne that cater to my specific interests. I have learned to live without them, though. 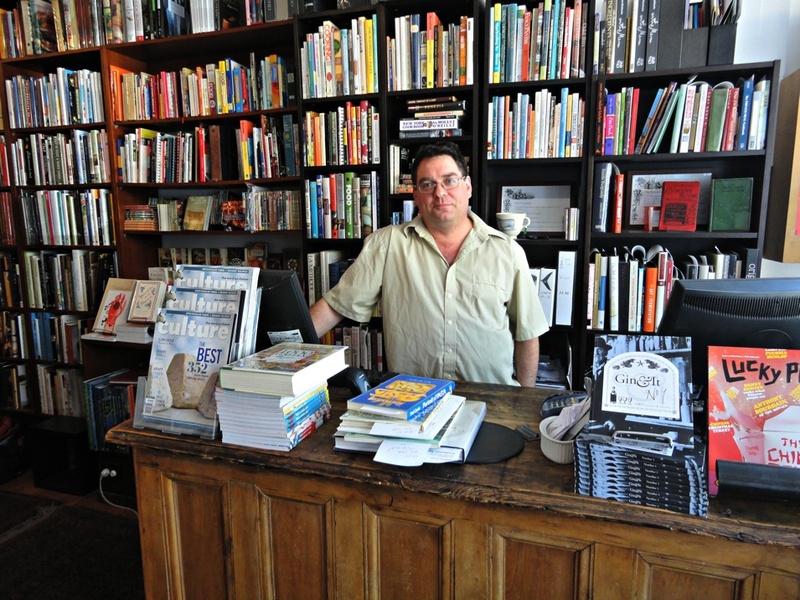 But in the form of Tim, at the splendid Fitzroy emporium Books For Cooks, I get a superb example of just why local, homegrown businesses should be encouraged whenever possible. As well as looking to do a story for Consider The Sauce, I have driven across town with the notional purpose of buying a Lebanese or other Middle Eastern cookbook to fill a gap in my modest home collection. I mention to Tim a particular book, one that is listed on the shop’s website but is not in stock. He knows the book well. He informs me of its background and its virtues and drawbacks. He’s not trying to dissuade me from buying it as such; it’s more like he’s trying to steer me towards a purchase that will suit my needs. We go through the same routine with another book, this one covering Persian cooking. 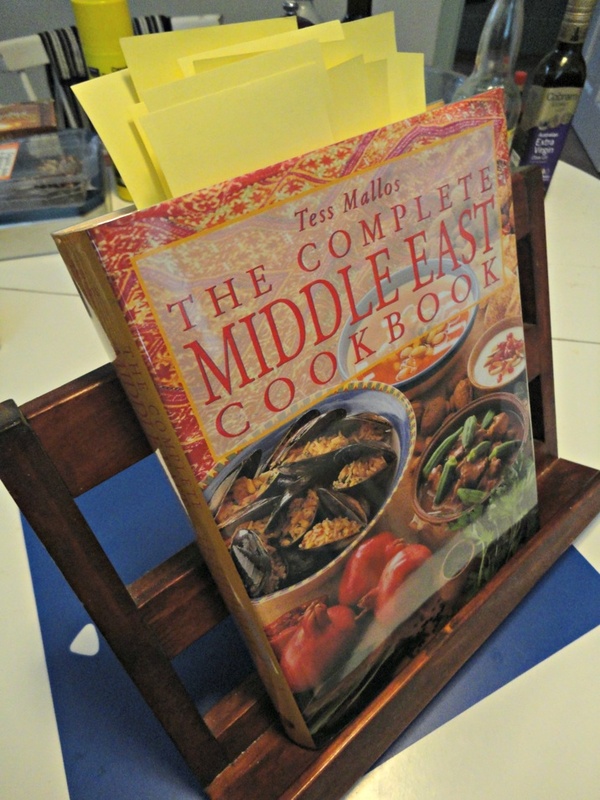 In the end, and somewhat to my surprise, I end up buying The Complete Middle East Cookbook by Tess Mallos. This makes all kinds of sense. The book is the same size and in the same format, using the same typefaces, as Charmaine Solomon’s equivalent Asian tome. As such, it will no doubt become a cherished asset and dependable companion in our home, and duly become dog-eared, sauce-spattered and loved a lot. As well, my new book’s concept of “Middle East” stretches from Greece at one end to Afghanistan at the other. So there you go – I’ve ended up with a book I can use and use often, and Tim has adroitly manoeuvred me away from the allure of those that had been seducing me with flash. Helping me buy a book turns out to be just a small part of an engrossing hour of conversation as Tim gives generously of his time and insights. 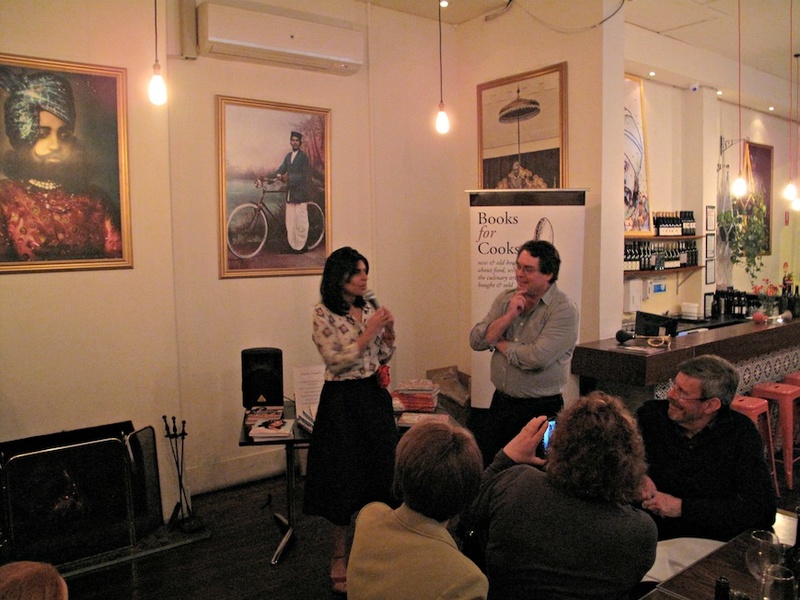 Books For Cooks is in its 13th year, Tim and partner Amanda having bought the name and “some stock” from a couple of dears for whom it was a sideline to their Malvern East travel agency. The seems scarcely believable to me, such is the detail Tim provides me on running the shop, the various inequities of the international postal system, the effects of the internet, the ongoing subject of a GST on online imports and much more. He tells me about 10 per cent of the shops turnover is online but that 40 per cent comes from the custom of professional cooks. The current best-sellers are three books by Israeli-born, London-based Yotam Ottolengh – Ottolengh: The Coobook, Plenty and Jerusalem. 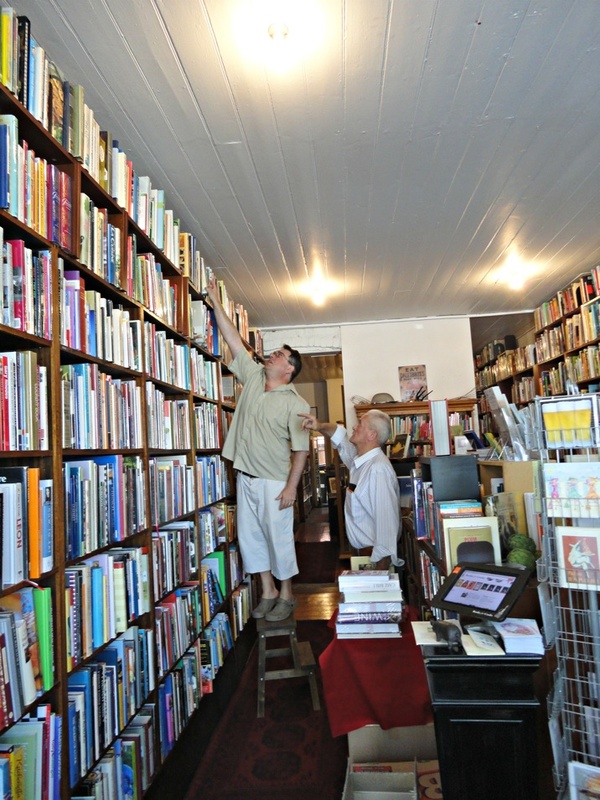 The shop will often stock two or three copies of a book – perhaps one will be secondhand, or another may be printed using a particular font. Books For Cooks sources books from about 650 suppliers in England, the US, France, Spain, Italy, Germany, Belgium, Sweden, Singapore, Japan, Canada and more. There are at least two incoming shipments a week each from the US and the UK. 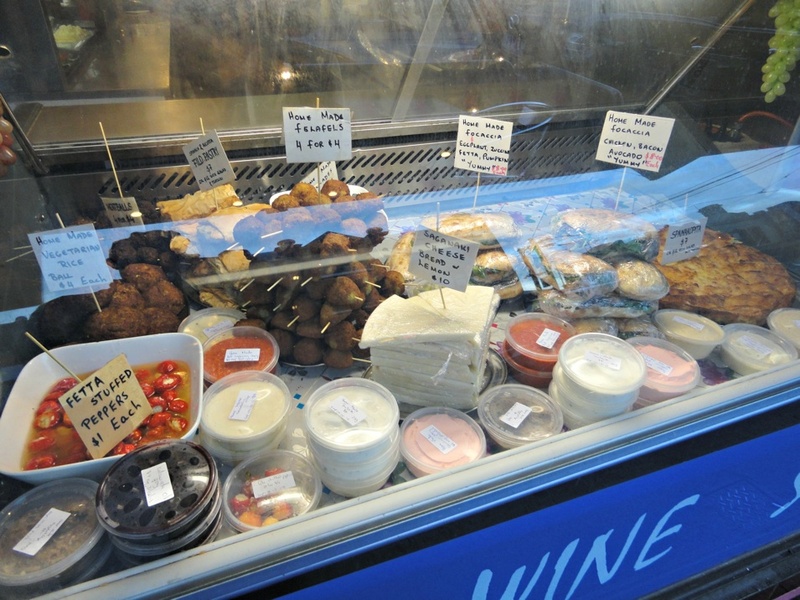 The main trade, of course, is in recipe books of many different kinds, vintages, sizes, styles, genres and nationalities. But Books For Cooks also carries titles that cover biographies, history, philosophy, anthropology, sociology, food science, humour, fiction, kitchen design, implements, wine, spirits, coffee, tea, health, etiquette and table settings. And no doubt several more categories! We even get around to discussing the merits (mostly Tim) and otherwise (mostly me) of MasterChef and its various offshoots. But we end up in pretty much the same place anyway. He definitely says that as if he believes it’s a good thing. And which is why, within a few hours of getting it home, my new cookbook is prickly with stickies denoting my interest in recipes that are overwhelmingly to do with cabbage rolls, pulses of all sorts, hearty stews and simple salads. Check out the Books For Cooks website here. More than two years, way more than 300 posts … and no Greek eateries on Consider The Sauce? There’s a few reasons for that, I reckon. One is that they’re not thick on the ground in our immediate neighbourhood and only slightly more common in the greater west. 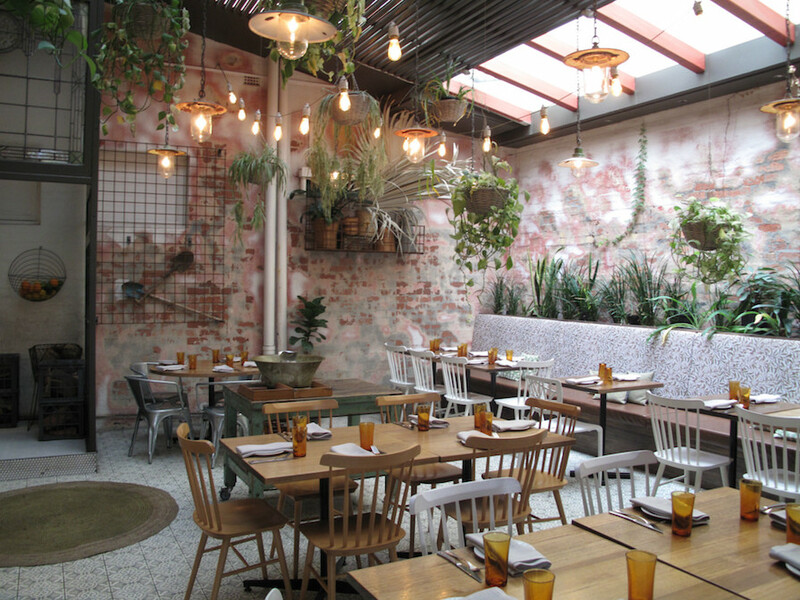 Not that Greek restaurant in Melbourne are necessarily out of our budget reach – though a couple in the west certainly fall into the “special occasion” category. It’s more that we mostly feel we can get pretty much the same flavour hits from very similar food that is of the Middle Eastern derivation at significantly lower prices. As previously noted, that sort of much-loved thing is not ubiquitous in the west, either; hence our regular journeys to Coburg! 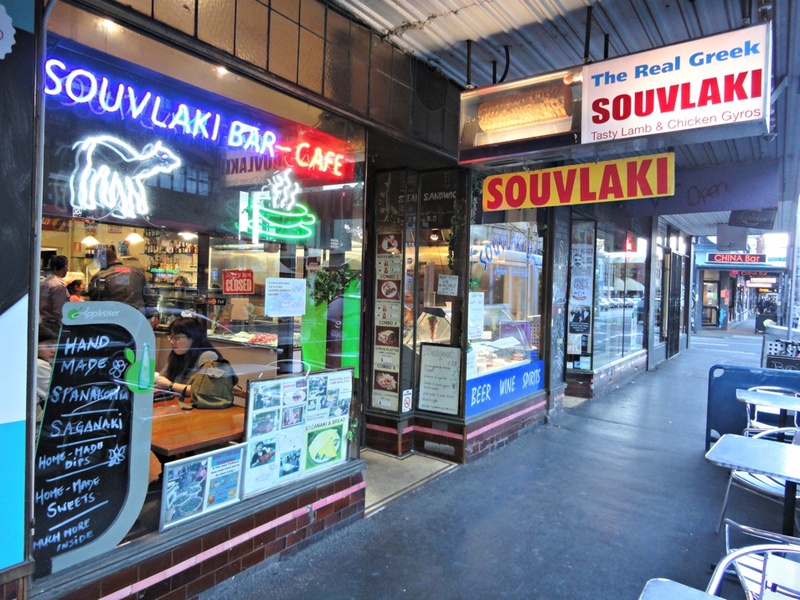 So it’s lovely to visit The Real Greek Souvlaki in Brunswick St.
We reckon it is right up there with the best Greek restaurants in Melbourne, with perhaps only the absence of seafood counting against in terms of comparison with its more formal counterparts. That’s an assessment that may surprise its regulars. Because this place, I’m certain, finds a really, really big share of its turnover coming from the souvlakis that are also known these days as wraps. Most of these would be sold, I’m equally certain, at hours when we’re sure to be tucked up in bed and are no doubt especially brisk sellers around closing time … if Brunswick St actually has a closing time. 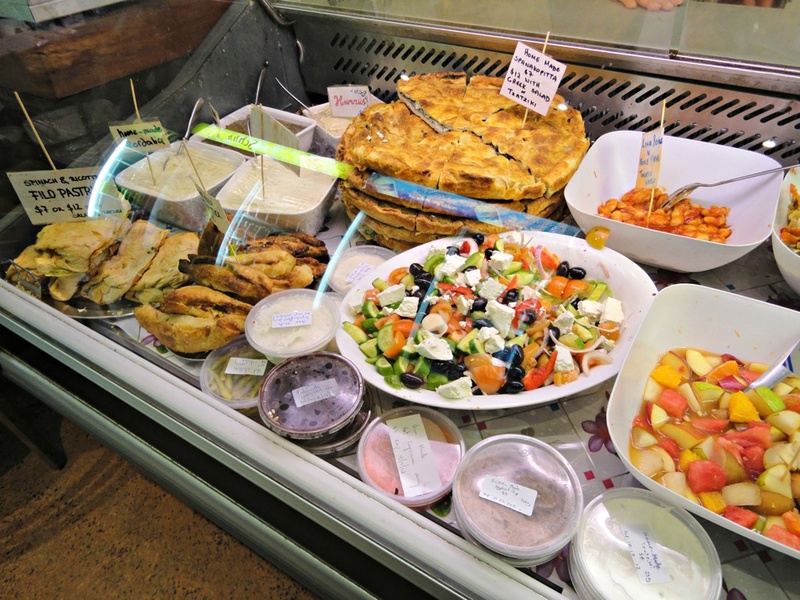 But you can get sit down plate meals at the Real Greek Souvlaki – and at prices much lower that at more famous Greek places, including one just a few blocks away. 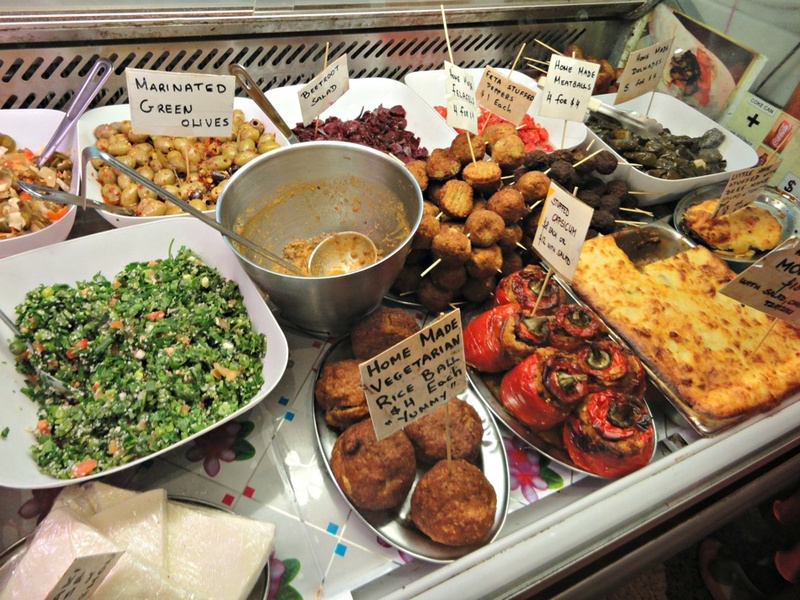 Moreover, just on the basis of its wonderous displays of mouthwatering Greek meze, this establishment deserves to be regarded far more highly than as a mere souvlaki joint, regardless of its informality and basic stock in trade. 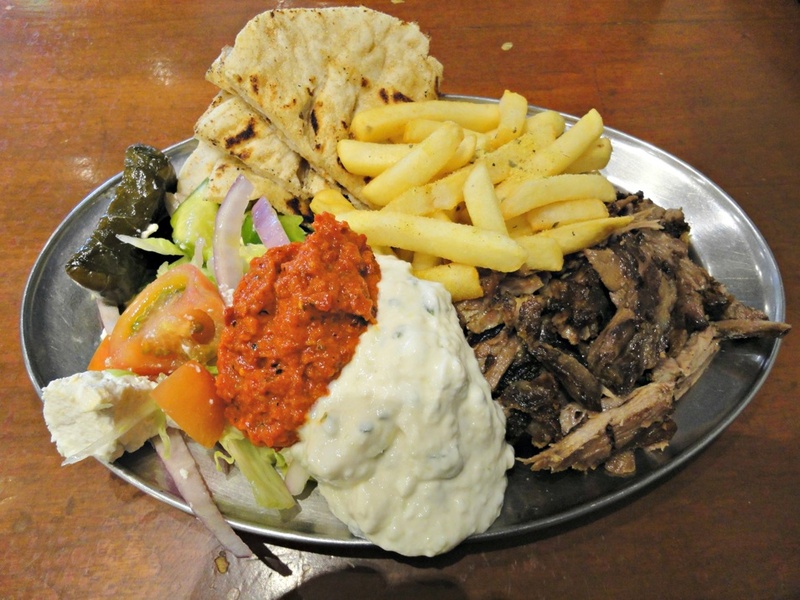 Perversely, today I feel like a Greek meal of far more basic type – lamb from the spit, salad and chips. The chips are just OK – a little flaccid and heavily chicken-salted, but hot and very edible. The salad is fine and includes enough olives and sharpish fetta cheese to satisfy. The lamb is superb – crunchy, top-of-the-line delicious and cuddling up to your basic garlic/yogurt sauce. 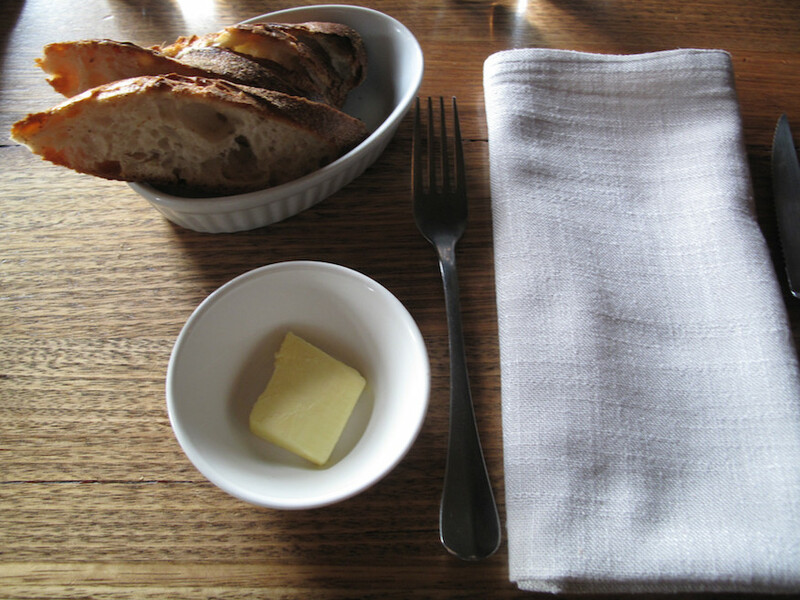 I get all this for $17 – including an extra dollop of chilli dip and a small dolmade. The chilli dip is more like hot pepper dip, so has only a mild spice kick but is very piquant and just plain great with the meat. I wish there was a whole lot more of it.